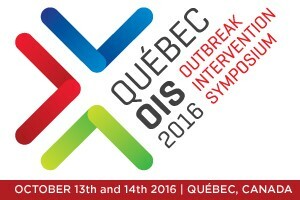 QUEBEC CITY, October 14, 2016 - Nearly 100 specialists were in Quebec City yesterday to kick off the Outbreak Intervention Symposium (OIS 2016), which aimed to improve responsiveness in the face of public health emergencies and global disease outbreaks. The programming for the two-day event included a series of presentations by internationally renowned specialists representing organizations such as the World Health Organization (WHO), the UN Development Program (UNDP), UN Habitat, UNICEF, the Pasteur Institute, the Centers for Disease Control and Prevention (CDC), the World Bank, the International Federation of Red Cross and Red Crescent Societies (IFRC), Doctors Without Borders (DWB) and major universities and research institutions from around the world. These specialists work in a wide variety of disciplines, including research and development, virology, clinical medicine, epidemiology, anthropology, the social/behavioural sciences, urban development, healthcare funding and emergency operations. Mindful of lessons learned during the Ebola epidemic (2013-2016), the numerous participants focused on the search for new processes aimed at improving collaboration and communication within the international medical community. Evidently, the goal of optimizing these practices is to speed the reaction time of global public health actors. "I am honoured that Quebec City is hosting this major event. Now we are back here, I am delighted to see how dynamic Quebec City&apos;s health sector is," said Gary Kobinger, Director of the Infectious Diseases Research Centre associated with Laval University Hospital Centre (CHUL) and Co-Chair of OIS 2016. Juliet Bedford, Director of Anthrologica and Co-Chair of the event, said she was impressed to see so many members of the global medical community gathered together and sharing insights with a view to improving international public health. According to Carl Viel, CEO of Québec International, "OIS 2016 consolidates Quebec City&apos;s leadership position in the life sciences and healthcare technology sectors and showcases its cutting-edge expertise in terms of infectious diseases and vaccines. Recognized as a major development hub thanks to the presence of key research institutions and university hospital centres and innovative companies, Quebec City was the ideal location for our renowned guest speakers, our prestigious guests of honour and the many participants who came to work hard and do their part to improve global health." Québec International contributes to regional economic development and promotes Quebec City&apos;s international standing. As the pre-eminent economic development agency, QI fosters business growth, supports key economic clusters and attracts talent and investment. For further information, please visit www.quebecinternational.ca.